Toshiba 40TL868 review | What Hi-Fi? Toshiba appears to have rediscovered its mojo. The 40TL868 is a classic example of the type of TV the company used to excel at: thoroughly competent in every department, smart to look at and, perhaps most importantly, affordable. 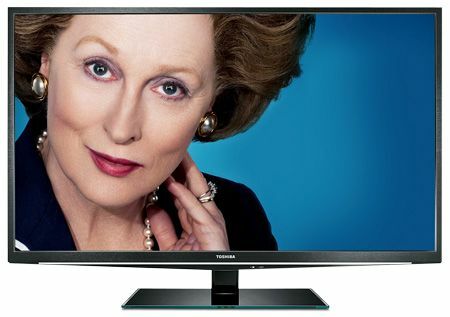 A 40in LED-backlit set with Freeview HD plus 100Hz processing on board, it might not be the best TV we've ever tested, but it's certainly a lot of quality for your cash. It's 3D-capable for a start, although it doesn't come with glasses. However, the optional FPT-AG01G active-shutter ones are less than £60 at the time of writing, so even in fully specced-up form, the 40TL868 remains a relative bargain. It's smart, too. Last year's Toshiba range suffered from limited online functionality, but the 40TL868 is a big improvement, offering BBC iPlayer, Facebook access, Aupeo! music streaming and more via its Toshiba Places portal. The platform works well, and if you splash another £40 on the WLM-20U2 dongle, you can go wi-fi, too. All this, and the Toshiba's picture is consistently capable whatever you throw at it. Its motion-handling is decent as long as you set its motion processing to a fairly low setting, and even in 3D it's a largely stable and enjoyable watch. Black levels and contrast are also up to par: there's some backlight inconsistency when the TV is on idle, but with a signal there's no obvious cause for concern with moving images – even Harry Potter's murky offering. Sound is clear too, although it lacks big bass. What of broadcast TV? Oddly, the Toshiba includes a satellite input to match its aerial in, but it isn't Freesat-approved, and doesn't come backed by the Freesat EPG. Not that it matters much, because the Toshiba's Freeview HD pictures are fine, if not as subtle as the best plasma sets. But, of course, that's not the point. The 40TL868 costs way less than something like Panasonic's TX-P42GT30 (our 2011 TV of the Year), yet it's not disgraced in the company of that exalted set. That has to make it a bargain, and has to mean it's well worth every one of its five stars.